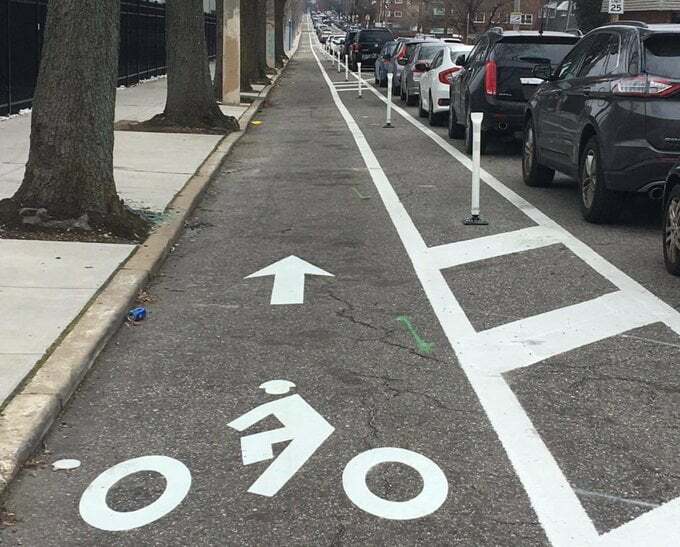 Chances are, you’ve probably heard about some of the new protected bike lane projects coming to Philadelphia lately. There’ve been numerous meetings and a whole host of you have shown up to support these projects. Well, the community meetings are still happening and it’s still up to you to show up, bring a friend, and support these protected bike lane projects for a safer Philadelphia for all. A protected bike lane was proposed on the left side of the street between Spring Garden Street and Race Street and was presented at a public meting at Yards Brewery on January 29, 2019. The meeting was met with a mostly positive reception. However, we have heard that there are additional questions and concerns over the losing parking and loading spaces. Therefore, another meeting may occur to quell concerns and potentially offer an alternative solution. We will post an update when that meeting is planned. A protected bike lane has been proposed on 5th Street, between Market and Spring Garden Streets. This would create a high-quality route for cyclists traveling out of Center City. This plan was presented at the same public meeting where we heard about 2nd Street. We have not heard information about any community opposition to the 5th Street protected bike lane project. A protected bike lane has been proposed on 6th Street to accompany the 5th Street protected bike lane, which would bring cyclists into Center City. The lane would go between Spring Garden and Market Street. We have not heard any community opposition to this plan. In January, meetings were held with three civic associations to propose a protected bike lane along 10th Street, between Spring Garden and Lombard Street, save Chinatown. We have not heard any opposition to this project since the January meeting. A new protected bike lane safety project has been proposed for 11th Street. Spanning from Bainbridge to Reed Streets, OTIS’ project calls for a two-way protected cycletrack on this already well-used corridor. In addition to the protected bike lane, the plans on 11th Street will improve crosswalks and lane markings, prevent vehicles from stopping and parking in the crosswalk, and will make the street safer, and more comfortable for crossing the street. 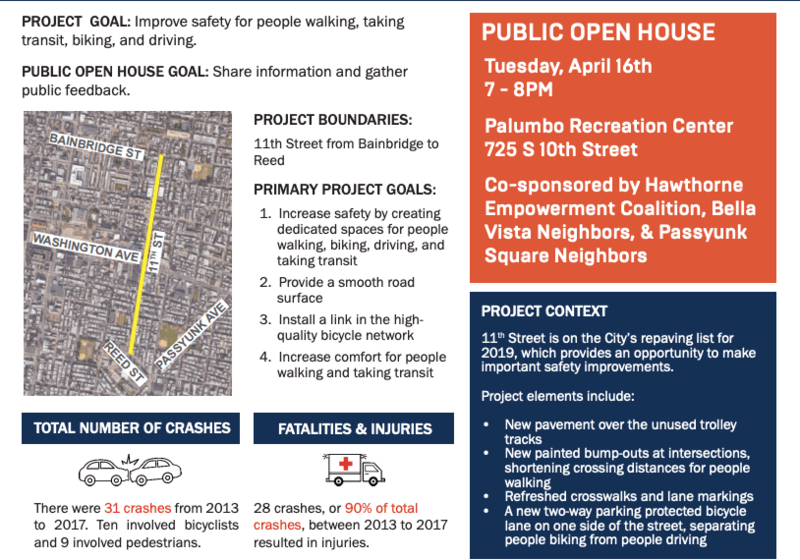 There will be a public open house on Tuesday, April 16 at Palumbo Recreation Center on 725 South 10th Street from 7pm-8pm to discuss this project. We encourage your attendance, and bringing your non-bicycling friends to show them how bicycling projects have a positive effect on everyone in the community. A protected bike lane project was proposed at the same time as the 10th Street project. This lane would be a northbound accompaniment and an extremely important project, considering the 13th Street bike lane in Center City is one of the most abused in the entire city, according to PPA data and everyone’s eyeballs. While the meetings were positive, there have been some questions about the sort of protection that will be used on the street through the main business corridors. We are speaking with community stakeholders about this. After years of activism, a new solution was proposed for 22nd Street, including re-paving/re-striping the lane between Snyder and South Streets in South Philadelphia, then a protected bike lane between South and Market, then a standard bike lane to connect to the already-protected bike lane between the Parkway and Spring Garden Street. Click here to send a message to Councilman Kenyatta Johnson and the Office of Transportation, Infrastructure and Sustainability supporting the project. A small section of Germantown Avenue, between Master Street and Second Street, is up for protection as well, as part of a project between OTIS, the Water Department and the Streets Department. 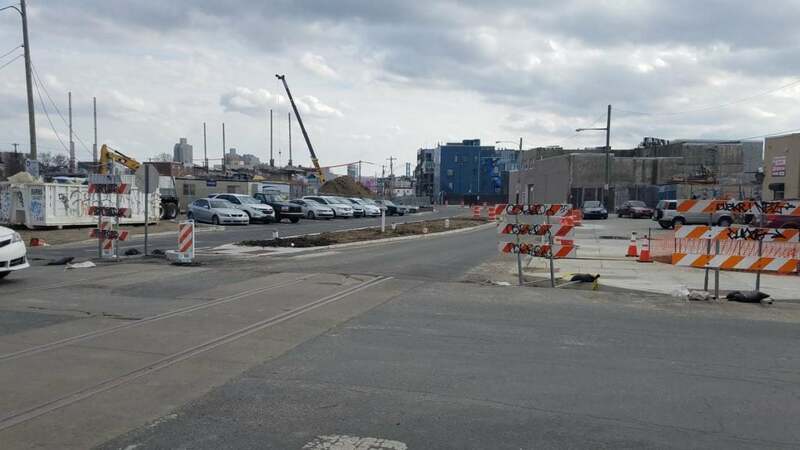 The project will include flood relief, a new signal at Germantown and Girard, and a concrete island at Thompson Street to make crossing safer for pedestrians. This project will also create a connection south past Girard Avenue when the American Street protected bike lane is complete. We are not aware of any community issues with this plan but more community outreach and City Council action is needed to move this forward. We will keep you posted on next steps on this one. The American Street center bike lane project is underway! This project will go between Indiana and Girard, remove unused trolley track infrastructure, and install new ADA ramps along the corridor. A group of cyclists visited the project a couple weeks ago the day before the Bicycle Coalition’s Vision Zero Conference, and were explained the ins and outs of the project by members of OTIS and the Streets Department. We don’t have a completion date for this project, yet. The tracks on American were never used by trolleys. They are standard gauge, only used by freight deliveries to/from factories along the street. Great summary, otherwise. Let’s keep pushing for change! Once we have a decent network, ridership will grow exponentially! One additional area that i urge BCOGP to push for is to get the city to run sweepers occasionally (once or twice a year may be enough) over existing bike lines. Some are so bad, you have to ride outside of the lanes.